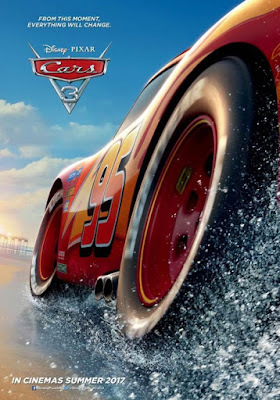 Cars 3 is now in cinemas everywhere and is distributed by Walt Disney Studios. Disney Pixar has completely redeemed it's popular Cars franchise, by allowing Cars 3 to be exactly what Cars 2 should have been and goes even further than this. The third film in the popular Disney Pixar Cars series captures the essence of the original film, but brings to life new, intriguing characters who bring with them important and relatable themes. Cars 3 also surprisingly takes a stand by breaking down gender stereotypes in a quiet, but highly effective way. For this reason, Cars 3 may actually even be superior to the original. Brian Fee has proved to be the perfect person to take over the Cars franchise from John Lasseter, who co-directed the first two films with Joe Ranft (Cars) and Brad Lewis (Cars 2). Fee and his team of writers have successfully identified what made the first film a success and what gave the second film the unenviable reputation of being known as the worst Pixar film so far. Cars 3 embraces the themes of remembering where you come from and kindness to others that resonated during the first. It also brings back the excitement of the world of high speed car racing that runs parallel to quiet moments of reflection in quiet, rural towns. 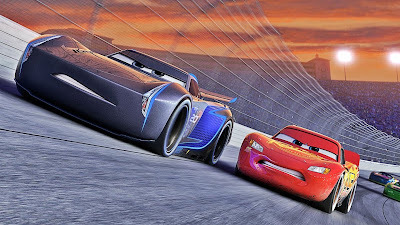 However, the Lightning McQueen (once again voiced by Owen Wilson) we meet here is a much different race car compared to the character he once was in the previous films, as he exhibits in the very first scene when he questions himself saying his usual "I am speed" mantra. While he is still regarded by many as a champion, he is falling behind as new and improved race cars are making their way into the competitive arena. He is labelled and ridiculed by many as the old guy, especially by the new and cocky Jackson Storm (Armie Hammer). It is a situation that will ring true for many. As our world progresses, it is not only sportsmen that are finding themselves in the shadows of younger competitors, but people in any industry. There are new products being developed and people are being made redundant as their positions are being dissolved. What Lightning McQueen reminds us is not to give up without a fight. However, at the end of the day, there is always a Plan B as he finds thanks to Cruz Ramirez (as voiced by Cristela Alonzo). Disney has always been a champion for strong women in their animated films. What makes Cruz Ramirez different to the strong female characters that have come before her is that she is a girl in the racing world which is primarily a male domain. However, this is not the only that that is ground-breaking about the character of Cruz. She is a trainer who has always had dreams of becoming a racing car, but those around her made her doubt herself by encouraging her not to reach too high. The beautiful thing here is that her gender is never once addressed. It is never said that she is discouraged based on her gender. This is the right way to break down gender stereotypes in cinema. We have also seen this recently in Wonder Woman , where Gal Gadot's Diana takes it on herself to save the world and is the only female fighting in the trenches. Yet, no one in the film speaks of how she shouldn't be doing these things based on her gender. As both Cars 3 and Wonder Woman prove, gender stereotypes are broken down when they are not directly addressed in the film. Gender equality is achieved when gender is no longer questioned. Cars 3 is deceptively simple. There is plenty for young families to enjoy with it's stunning, colourful visuals and basic themes, but there are also themes of greater depth built into the story which makes it as important for adults as it is for children. In this way, for what reason do you discard cash with purchasing a fresh out of the box new car while you can get a high caliber and late model utilized car.